Habitat : Indigenous to mediterranean regions and southern europe, but prospers almost anywhere in temperate climate. Uses : The flowering tops are anthelmintic, strongly antiseptic, antispasmodic, carminative, deodorant, diaphoretic, disinfectant, expectorant, sedative and tonic. The plant is used internally in the treatment of dry coughs, whooping cough, bronchitis, bronchial catarrh, asthma, laryngitis, indigestion, gastritis and diarrhoea and enuresis in children. 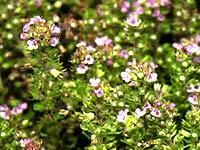 It is used in the treatment of tonsillitis, gum diseases, rheumatism, arthritis and fungal infections. It is very rich in essential oils and these are the active ingredients responsible for most of the medicinal properties. In particular, thyme is valued for its antiseptic and antioxidant properties, it is an excellent tonic and is used in treating respiratory diseases and a variety of other ailments. The whole herb is used in the treatment of digestive disorders, sore throats, fevers etc. Leaves are highly aromatic and are frequently used fresh or dried as a seasoning in a variety of culinary applications including soups, stews and sauces. It is useful in cases of wind spasms and colic, and will assist in promoting perspiration at the commencement of a cold, and in fever and febrile complaints generally.